I'd like to take a break from all the MAYhem to address a personal phenomenon that occurs steadily on an eight or nine months cycle. A condition known as Zimmermanitis, or to the layperson: a Bob Dylan Kick. As mentioned ad nauseam on this blog, Bob occupies more of my shelf-space than any other artist, so it isn't so far-fetched that I'm able to revisit his catalog regularly without wearing a rut in any particular era. Not feeling folky? Desire is here for you. Is Bob's post 80's Renaissance the last thing on your mind? Well surely Blonde on Blonde will scratch your itch. The present kick was brought on by a number of unrelated incidents: My recent blogworthy recollection of the infamous fingerslice; a screening of The Big Lebowski that reminded me how great "The Man In Me" is; a gig I played this weekend during which I covered a few tunes. Recorded with The Band during Dylan's late 60s hiatus from touring, The Basement Tapes' effortless feel is perhaps its strongest quality. This likely results from the combination of Dylan's songwriting with The Band's slick and snappy roots rockery. 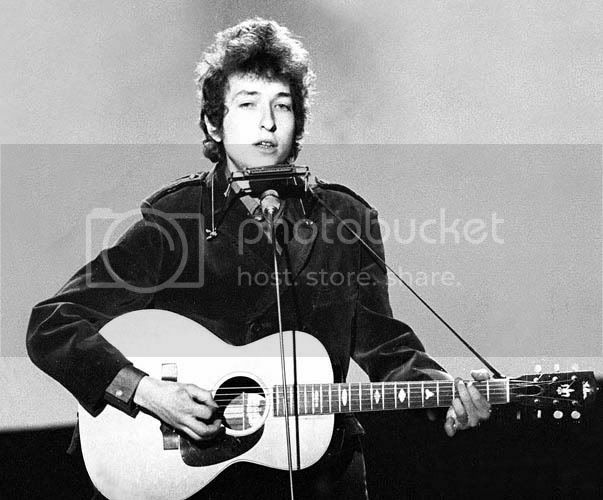 Dylan had graduated vocally from the nasal wail that characterized his post-folk output, and assumed more of a gravelly, relaxed style. In fact several of Basement Tapes songs were recited more than they were sung--"Yea! Heavy and a Bottle of Bread" and "Please Mrs. Henry" come to mind. The album is one of those universally-lauded releases that should be required listening to anyone who fancies himself a music fan. It should be mentioned that a handful of the tracks are Band-only, and would eventually show up on Music From Big Pink. Of the three live albums that came from the Bootleg series, Volume 6 is undoubtedly my favorite. It features a young, humble, silly (and maybe stoned) Dylan playing in front of an adoring crowd. I like the album so much because it captures a sort of vulnerability that existed prior to Dylan's deification and his ensuing resentment of his Messianic treatment. Here he's just a 23-year-old kid, enjoying himself, cracking jokes, forgetting lyrics. Some others I've reconnected with recently: New Morning, Freewheelin', Highway 61, and Blood on the Tracks. All low-risk classics, sure, but just as awe-inspiring as ever, rewarding my ears anew with each fresh spin.